Dandelions are starting to bloom around the metro area. This is the first major nectar flow of the season. A much needed bounty of nectar and pollen. I like looking at the hive entrances this time of year. They are a bright yellow from the pollen. I make sure the bees have room to put the nectar. If a strong colony does not have room to put the nectar, they may fill the hive with nectar plugging all the cells solid. With the hive plugged solid, the queen will have no place to lay eggs. The hive will dwindle and not get any bigger. This hive may even not be able to over winter because they will weaken so much. The solution is a super on top of the colony. A strong colony might make an extra 60 lbs of Dandelion honey. Hello St Croix Free Press Readers This is how to start a hive. 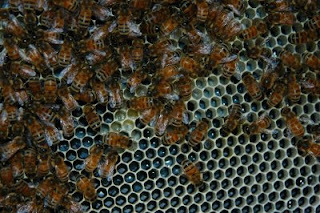 A hive is started in April with a 2 lb or 3 lb package of bees with queen. 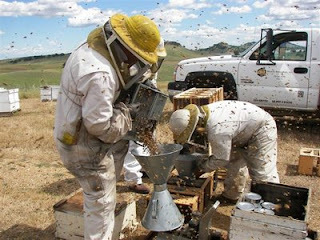 Shaking bees into 2 lb and 3 lb packages in Calif. The article in the St Croix Free Press didn't get all the facts straight. I do not get my bees mail order. They are trucked in from Calif on a special truck designed for hauling bees. This is how to start a hive. Releasing a queen the first time is a nerve wracking ordeal. Will I kill or injure her? How does she get out of her cage? Being careful not to drown her in syrup or chill here before putting her in. The marshmallow method works great but the thing to remember is, This release method is a fast release. Introducing a new queen that has not been in a package cage for four days with a marshmallow will probably by a quick demise to a $20.00 queen. A slow release is a hard candy that takes the bees about 4 days to release the new queen. Or the best release is to hang the queen cage in the hive for four full days then either directly release her or put a marshmallow in the cork hole for a 3 hour release. Looking for eggs, how can I see them? Another Terry McD video. She caught me explaining to a customer how to see eggs. Another way I recommend how to see something about beekeeping. Is to click Google - Images and type in the picture you would like to see. This is what I hope to see. 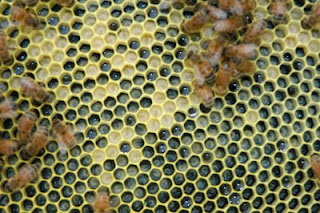 A frame with a solid pattern of brood in egg and larvae stage. The bees aren't capped until day nine after the egg has been laid. It has been a week since I installed my packages. I am going out today to open the hive and look for eggs. If I see eggs I know the queen is alive. No reason to look further I will close up the hive. Maybe refresh the pollen patty if it is getting hard. I know the package probably didn't eat it all but a fresh one keeps the hive moving forward. Refilling the feeder pail is also on the to do list. If I don't see eggs I will close up the hive and check again on Tues. If I don't see eggs I know I need a queen. Failure to check for queen acceptance can lead to the death of the colony. Teri McD has made another you tube video. It demonstrates a springtime reversal. Looking for Queen Acceptence after hiving a package. This is a new frame about 10 days from when the bees started working on it. The bees start at the top and work their way down a frame. This frame has black foundation. After putting in a package of bees they need to establish themselves in the hive. I don't look inside at all. I know that seven days after hiving them I have to go back and open up the hive while wearing Protective clothing and a lit smoker. This is looking for queen acceptance. I know that failure to check for queen acceptance will lead to possibly the death of the colony. I will start at the side where no bees are and remove a frame or two. Then I gently slide the frames back until I get to where the cluster of bees are. Removing one of these core frames I will scan it for eggs. I look at the frames until I find them. Once the eggs are found there is no reason to look any further. I know the queen is alive within the last three days. One has to resist the temptation of looking for the queen. The more the frames are disturbed the odds of accidentally killing her go up. If I see eggs I know the queen has been accepted. If I don't see eggs I close up the hive and come back three days later. Again I will look for eggs. If I see them I am good to go. If there still is no eggs I know she is dead and I will need a new queen. A new queen would be installed with the slow release method. A marshmallow is not a slow release. Candy in the queen cage is the proper method. Opening a hive more than once a week will lead to queen supersedure and will adversely affect the hives ability to survive. I had a couple of questions. I bought the feeder bucket from you, but it was leaking and the syrup was dripping out of the hive. So I changed the feeder to the Mann Lake hive top feeder I had. Do you have any suggestions with the bucket feeder so I could use it? Also, I put grass in the entrance. But I had the 3# box in the deep super (I couldn't spray the bees with sugar water due to the temp, and couldn't get all of the bees out). I went in the next day to get the box, I still couldn't get all of them out, so I put the 3# box by the entrance so they could go in the hive (therefore I had to remove the grass). Should I replace the grass back? The hive has to be reasonably level or the pail will leak, also the pail should be full when you put it on, and the top needs to be snapped on tight. If you do this the pail will not leak. Some of my hives are not level. I bring a pocket level with we and level the pail by shimming one side with a stick or corn stalk or whatever is laying around. The grass should be out now. If you can't get a few bees out, it is not an issue. This is the bear that has been been hanging around. Causing a ruckus. My trail camera time was off due to the batteries died and I didn't reprogram it. This was taken on April 11th. Obviously the time is wrong on the picture because it is light at 8:17 am. Another video by Terry McD. She noticed yesterday there was no pollen coming in. Today the bees are finding some yellow pollen. Note the yellow pollen on the bees hind legs. This happened the same time as the hostage situation. Now to add to my stress level. I had a visitor last night. My bird feeders were wrecked, a pallet of misc bee stuff was in disarray. And of course what tipped me over is a missing pail of corn syrup. I had a few pallets of pails of syrup and some hives a guy wants to me install some bees in. The pail is gone and down the hill about 200 feet from the pallets. The pail weighs 60 lbs. The pail is full still. He didn't get it open. And of course the hives that were screwed together with sheet rock screws were torn apart. And he will be back tonight. The bees will be ok tonight in the barn and the garage. A post note he did come back and wrecked two pails of syrup.